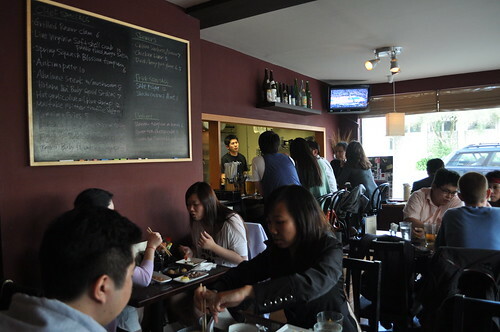 After perusing the April 2011 issue of Budget Travel, my mom read a small piece on izakayas, i.e., Japanese pubs, and suggested Marcus and I make a visit to Izakaya Sozai, a Japanese tapas joint, located in the neighborhood of Inner Sunset in San Francisco. I told Bill and Pam that we would love to try Izakaya Sozai while we were over in San Francisco, so Bill and Pam took us here for dinner on Thursday, the day we arrived to town for our six-day trip. They had been here a few times before, so they knew what menu items were must-orders. 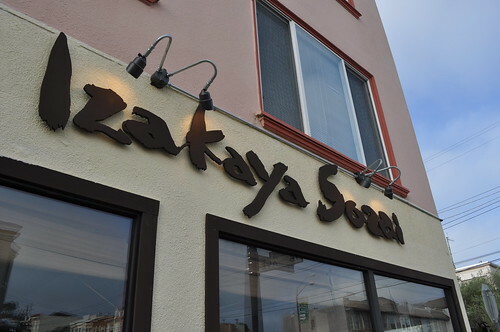 Opening not too long ago in early February of this year, this 30-seat izakaya is constantly bustling with patrons. Luckily, they permit reservations, and having called a month in advance, we were set for a table for four around 6:45 PM. 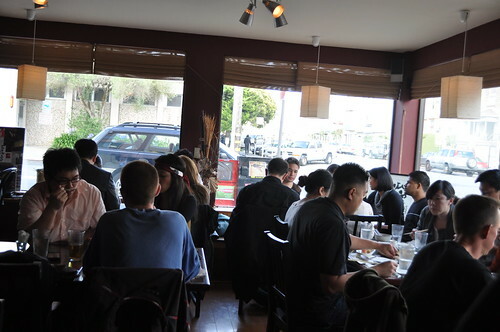 View of the restaurant's other tables. 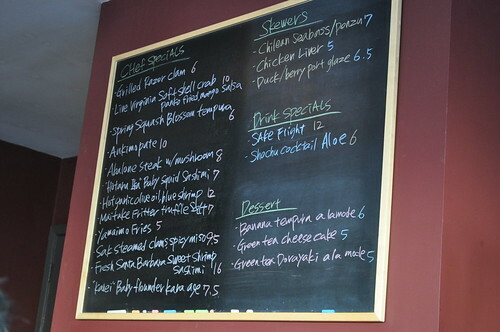 Along with the menu that is offered regularly, there are a number of specials that appear on the blackboard as well. 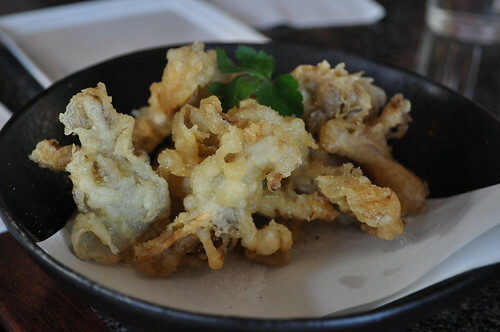 The first item we had was from the specials board--maitake fritters with truffle salt. This was one of my favorites during dinner at Izakaya Sozai. Pam noted that she initially found the fritters to be really salty from the truffle salt but then realized that the salt melted into the matter and then into the maitake mushroom in some mysterious fashion. Even the aroma from the truffle salt added another level of enjoyment to this dish. But then again, like bacon, when does the added flavor, taste, and aroma from truffles (in any form--oiled, salted, shaved, etc.) ever NOT make a dish for the better? I can't think of any scenario where it wouldn't work out! 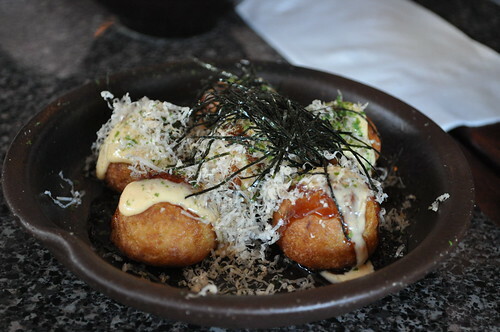 From the menu, we started with the takoyaki, battered octopus balls with tonkatsu sauce. On top of all of this were bonito flakes, spicy mayonnaise, and shredded nori. The takoyaki were served really hot in temperature (just as it should be), and they were really delicious. The saltiness from the bonito flakes and the nori along with the spiciness of the mayonnaise and tanginess of the tonkatsu sauce went really well with the battered octopus. The best way I can describe the texture of takoyaki interior is similar to an Americah hashbrown. 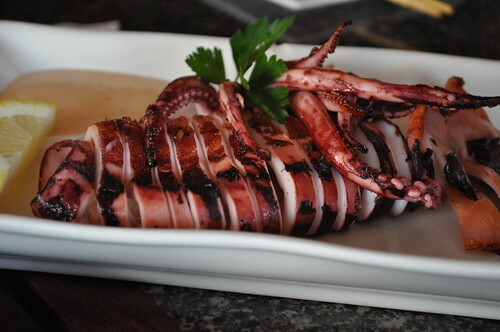 Next, we had the grilled whole squid with a spicy aioli. This was everyone's favorite overall. The meat was really soft and not overly chewy (what I've heard someone describe as "not tasting like an eraser"--couldn't have put it better myself). The preparation of the whole squid on the grill added that extra smokiness to the meat, and the spicy aioli was a punchy condiment that went well with the squid. 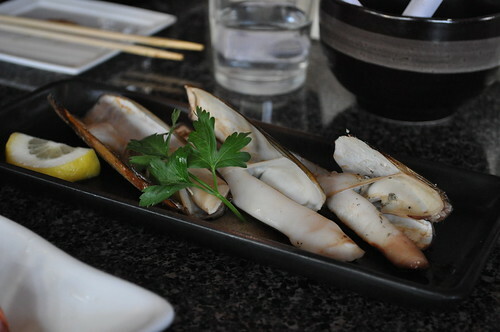 Also from the specials board were these grilled razor clams. These were a bit chewy, but still very enjoyable. I expected a little bit more flavor from the sauce/marinade, but it seemed like straight razor clams with a hint of lemon juice. 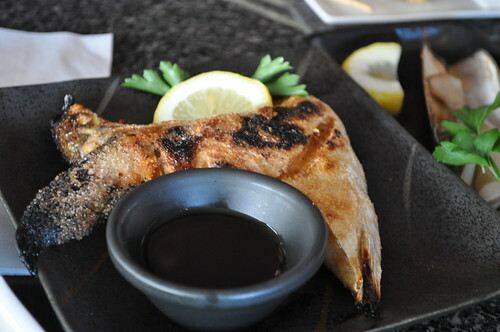 The squid was followed by grilled hamachi kama, which was grilled yellowtail collar. The exterior is nice and crispy, while the interior is soft, moist, and flavorful. The sauce that came with the hamachi kama was a really light soy sauce that was mixed with a little sake. It complemented the fish really well in that it didn't overshadow the flavors from its grilled preparation--it just added more flavored moisture to the meat. We were skeptical about the sauce at first (i.e., eating the hamachi kama straight), but after Bill bravely went to try it on his hamachi kama, we immediately followed suit when he said it was really light and enhanced the overall flavor. 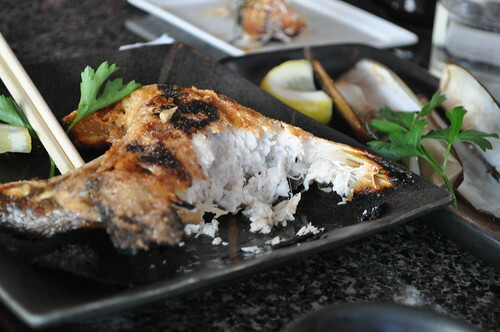 We were saying the best part about eating hamachi kama is searching for all the nooks and crannies for the meat of contained in the yellowtail's collar. We finished the meal with the ritsu tonkotsu ramen with the addition of pork belly. The broth was really flavorful with the added surprise of ginger. 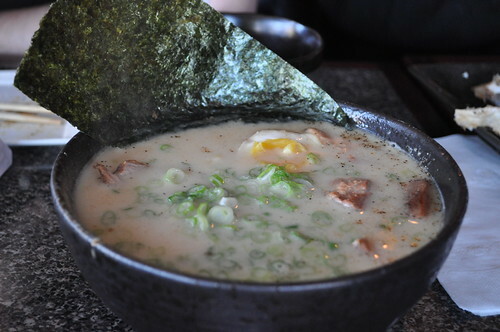 Unlike the ramen broths I've had in the past (where it delicious yet heavy and loaded with a strong, salty aftertaste), the broth at Izakaya Sozai is light yet effuses a bold, cooling flavor, leaving the clean and refreshing aftertaste of ginger. The ramen noodles fared well in this broth, cooked to the Japanese equivalent of al dente for ramen noodles. The pork belly was really soft as well--really tasty (I know how much I hate the word, but definitely somehow fits in the context here, haha) without being drowned in salt. Findings: Marcus and I enjoyed this casual dinner with Bill and Pam very much. I like the concept of Japanese small plates (tapas, if you will)--I haven't really had a chance to explore that realm back in New York City. I thought many of the dishes remained authentic to the cuisine of Japan, while the others, like the grilled squid and maitake fritters, explored an enjoyable, modern twist to classic Japanese ingredients (i.e., squid and maitake). I highly recommend this place for happy hour and for casual dinner with friends. The dishes are fun, delicious, and enjoyable--not at all heavy. Thanks again to Bill and Pam for a delicious dinner at Izakaya Sozai! Price point: $6-17 for each small plate.